The Sling is Black, not like the picture. Fully adjustable single point bungee sling with a quick release clip. The sling allows for easy transition of your weapon when operating. 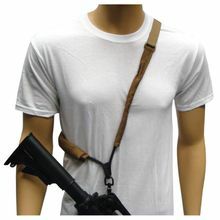 The single point sling allows the shooter to have the weapon hang at their side for easy access. The single point design allows for the shooter to easily switch from shoulder to shoulder.